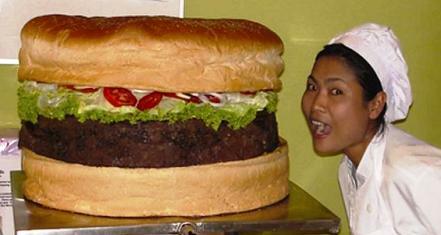 At a whopping 35 kg and measuring 60 cm in diameter and 35 cm in height, this burger is the largest burger on planet Earth. It is named Big Bob’s Texas Belt Buster and is available on the regular menu of Bob Schindler’s restaurant Bob’s BBQ & Grill in Thailand. Can’t help but wonder how many person it takes to finish such a gigantic burger? But it surely won’t be a problem for the dinosaurs. “You can order it in the morning and it will be ready to eat in the evening“ says Bob Schindler… He was aiming to build a burger that hit the 60 pound mark but a few miscalculations resulted in the burger going well over the target weight. The birth of the burger started off with a custom made bun made in Bob's in house bakery, and then 25 kg of Bob's top quality beef was cooked 6 ½ hours down to 20.4 kg. No burger is complete with toppings and this burger was topped off with 2 large heads of lettuce, 15 tomato's, 4 large onions, 35 slices of cheese, 1½ cups of mustard, 1 cup of ketchup, 4 whole pickles, 4 whole Jalapeños. Once the official certification is received, it will be added to the Guinness World records database under The World's Largest Commercially Available Hamburger. This is available on the MENU??? Now why would anyone need a 35kg burger I wonder. Perhaps it is more for defeating competitive eaters like Takeru Kobayashi! Yes but the 8th wonder has not claimed the official record and therefore Bob's is still the biggest.